AT&T earnings are disappointing investors, but when will the stock decline end? On a day where Boeing (BA - Get Report) , Apple (AAPL - Get Report) , Advanced Micro Devices (AMD - Get Report) and others are soaring on earnings, shares of AT&T (T - Get Report) fell Wednesday, about 4.33% to $29.37. The company reported in-line earnings results, but missed on revenue expectations for the fourth quarter. AT&T Entertainment Group saw more weakness while postpaid net adds disappointed Street estimates of 208,000 with just 134,000. Investors are pushing the stock lower, seemingly punishing AT&T for its lack of growth. However, this is not a growth stock, even despite management's reasonable outlook. The company is calling for low single-digit earnings growth this year and expects to generate about $26 billion in free cash flow. Ultimately, that's what it's all about. The more free cash flow the company generates, the faster it can pay down the debt it used to acquire DirecTV and Time Warner. The company can also use its strong free cash flow position to maintain its dividend yield. That income is a big component to the stock for investors. At current prices, AT&T pays a dividend yield of 6.98%. Its yield is more than just a high payout. Keep in mind, management has continually guided for strong free-cash flow to support the dividend. Further, AT&T is a dividend champion, not only paying a dividend but raising that payout for 35 straight years. To say it's dependable is an understatement. Over the last 30 years, AT&T has only had a yield of ~6.5% or more four times, and temporarily went over 7% just once -- during the Financial Crisis -- at its high. To some extent, investors may look for the dividend yield to support the stock price. But how does the stock look? Shares were consolidating nicely just below the 200-day moving average and earnings would have been a great catalyst to catapult T stock over this mark. Instead, it's holding at resistance as AT&T stock falls, now knifing through the 21-day and 50-day moving averages. From a technical standpoint, we may see some buyers step into AT&T near $29. Looking at the stock's volume, we've seen buyers come in to accumulate the stock near those levels. At that price, AT&T will yield just over 7% as well. 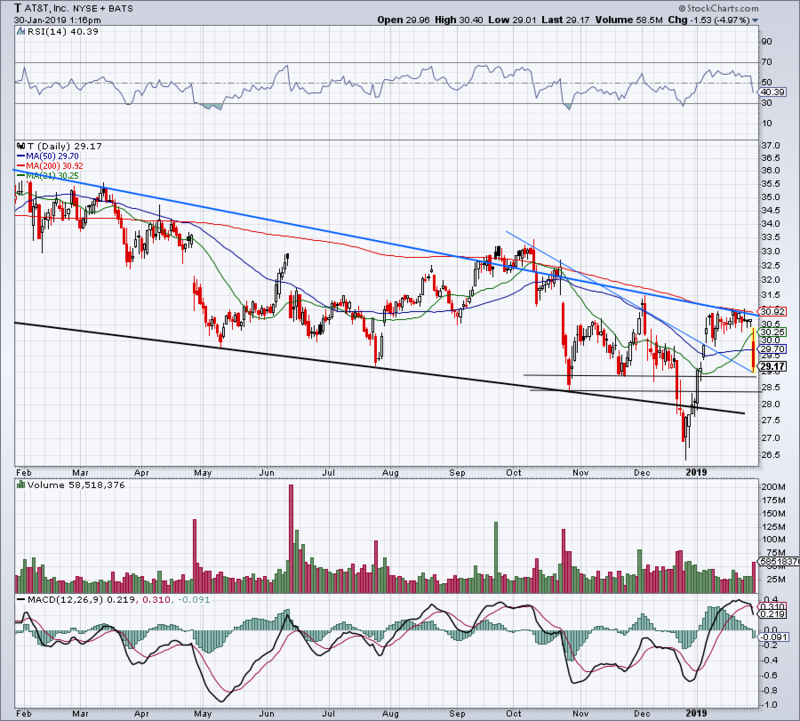 Should AT&T fail to hold $29, support may not come into play until $27.50-ish, a current downtrend support line. However, short of a broader market pullback, I don't know if I expect AT&T to hit these levels. Look to see how it does between $28.50 and $29 first.